Just to remind you . . . . There is a very famous quote which I suspect is actually required to be included, by law, in any self development book: “What would you do if you knew you could not fail?” It’s a useful question to break the deadlock of fear that stops you doing something. In her wonderful book “Big Magic – Creative Living Beyond Fear”, Elizabeth Gilbert asks a different question. Her question is this. 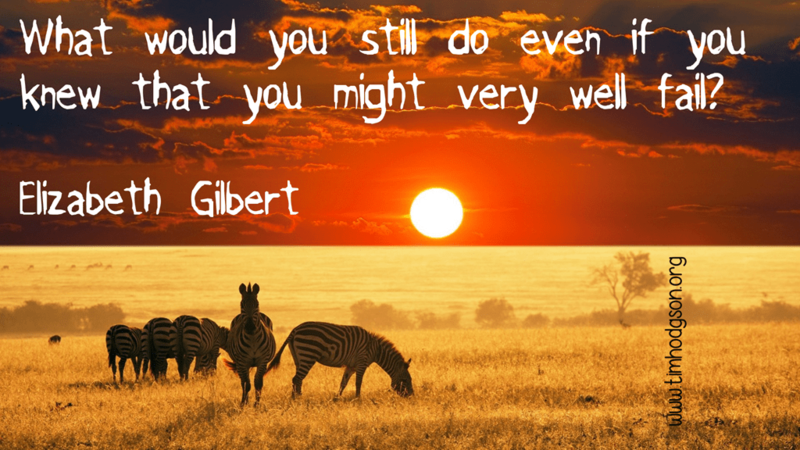 What would you still do even if you knew that you might very well fail? What is it that’s so important, so enjoyable, so critical to you that even if you thought it might not work out, that you would still do it anyway? What do you love so much that success doesn’t matter? What is it that would cause you to risk your fragile ego and go do it anyway? Don’t lose heart. Don’t stop fighting. Do not quit. Do not give up. You have got to leave everything on the field. That’s all that matters. “Did I give my best?” “Did I follow my heart?” If you do, then success is kinda irrelevant. It’s easy to decide what you’d do if you were guaranteed to succeed at it. But what is it that matters so much to you that success ceases to matter? For each of us there’s something. A cause, a purpose, a longing, a desire, that’s our true self expression. Go find it. Go do it. Sometimes I’ve struggled to find mine. But asking that one question has helped me more than anything else. (Elizabeth Gilbert is the author of (most famously) “Eat, Pray, Love”. Big Magic is a book about creativity, and fear, about Courage, and Enchantment, about allowing Creativity to have its way. I’d recommend it to anyone who’s an author, a painter, a sculptor or engaged in anything creative. And if you are one of those who don’t feel they’ve got a creative bone in their body, then you should read it. Because it will show you that you are oh so wrong about that. This entry was posted in Achieve your goals, Dealing with Defeat, Encouragement by Tim Hodgson. Bookmark the permalink. I believe that you are amazing. Incredible. Wonderful. Magical. I believe that you have gifts you don't yet know about, power that you don't yet believe in, and love that only you can bring. This blog brings you regular chunks of wisdom and encouragement to help you on your journey to discover yourself.